The saying goes that there are only two certainties in life – death and taxes. Well I’d amend that to include a third – that in life nothing is certain. As a Yes voter the certainties, or should I say consequences of what a No vote could carry is mortifying and downright horrifying. As Leonard Cohen rightly said ‘Everybody Knows’ now that principles and party allegiances are malleable to the shameless ambition of the grasping careerists that now populate much of Westminster. Yes it’s boring, but worth repeating, that the devolved powers we and Holyrood currently enjoy, which blunt the full impact of this ghastly coalition of losers, as Jeremy Paxman so pithily put it, may disappear, with the mandate and momentum a No vote could carry. While that isn’t a certainty, there is one in the event of a No vote: another eight months of Tory rule as part of the UK. And after that? Well how does another coalition sound? Or being dragged out of Europe by a xenophobic driven hubris? That the Tories are still polling relatively close after all their ghastly immoral deeds, greed and ineptitude, and UKIP are even registering any popularity at all should give any Scottish citizen pause for thought as they enter the ballot box on the 18th of September. It’s unlikely that UKIP would win a seat, but there’s nothing stopping the Lib Dems and the Tories from pairing up again. After all, birds of a feather stick together. Nobody can claim naivety to the possibility again. ‘Fool me once, shame on me, fool me…you can’t get fooled again’ as Dubya rightly put it. It’s been suggested by some, that we, that means folks within the UK, set aside any notion of national identity and the randomness that decides it, by showing solidarity and allegiance to, let’s put it this way, common decency. That means we should fight to retain or should that be regain Labour by permeating its mores and repatriating its socialistic policies of years gone, creating an actual relevant alternative to Westminster’s three headed centre right neo-liberalist conglomerate. It’s a nice thought, but an impractical one on many levels. For those who yearn for an alternative, a Yes vote offers a straightforward opportunity. It’s there, it’s accessible, and it’s happening soon. Even for those who struggle to conceive of a political landscape, or state, without relying upon the pillars of social and political tradition, and are sceptical of how a post independence Scotland would function, can acknowledge that the apparatus of the Scottish parliament is physically in place, and is functioning, albeit with restrictions and Johann Lamont. There are minority parties that represent many of the ideological staples once held by Old Labour, and yet they fail to attract votes or popularity. Why? We now live in an aspirational society, Thatcher’s society. As much you loathe to admit it she ultimately succeeded in shaping many of the attitudes, beliefs and desires we hold today, and by extension that’s shaped the political climate of the day. For the majority life goes on, without many true hardships, there simply isn’t the motivation to believe we can do better. The solution is actually straightforward, voting more dutifully and holding politicians to account, but thanks to Thatcher we’re too pre-occupied with paying our mortgages to concern ourselves with someone else’s problems or the insidious erosion of our own rights and the welfare state. That Labour are ahead in the polls, by default, makes it even more difficult to envision a complete turnaround in ethos. Success, no matter how meagre or unconvincing, has a way of validating the mediocrity of a campaign’s pledges and policies. I want to be removed from this dismal charade and the various faces and causes of the British populace’s indifference that underpins it. 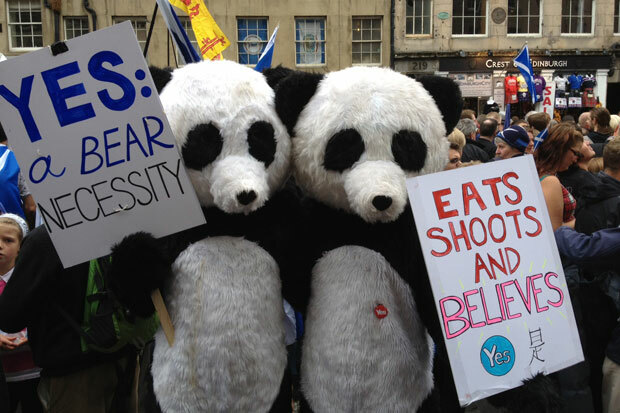 So I find myself looking at all the facets of the Yes campaign, and any flaws that could impact its success in September. Call it a rational fear of failure. It’s said that fear has a way of clarifying the mind. But listening to some Yes voters, you do wonder if it’s clouding it. Clearly the Yes campaign has the facts to support its mission, and the motivation to seek independence. So of course it has people that believe in it, strongly. This is evident in the literature and actions that support it. Have you received a Better Together leaflet yet? Do they exist? Yes, I know, but in this instance I was referring to just the leaflets. Armed with the facts, without insidious prejudices, it becomes hard to deny what a Yes vote could offer, when juxtaposed directly with the dire realities of continued Westminster rule outlined above. There is the question of what fuels people to vote Yes. I can only speak for myself here, it’s a pragmatic choice, not an emotional one. Will I feel pride, proud to be Scottish, if Scotland becomes an independent country? I doubt it. I’ll probably feel some semblance of satisfaction, as a Yes voter, if a Yes vote delivers a better standard of living, a robust economy (that’s always a euphemism for jobs), greater social cohesion and it engages people to demand a fairer more accountable political system than we’re currently beholden to. But to even have that opportunity first we have to attain a Yes vote, which brings us to how certain people are acting in trying to accomplish that goal, particularly when certain aspects and beliefs which they appear to believe to be synonymous with voting Yes or could be perceived as such, are challenged. Independence means never again having to treat our culture, arts, language and history as second rate and inferior to others. I suggested that great art exists in a vacuum, irrespective of the culture and country borders that it is ascribed to. Essentially this was my diplomatic way of saying that tweet was complete pish. In truth I wasn’t presenting myself as being entirely genuine. I was curious as to how people would react to the sort of questions that would be posed by someone without a clear bias or allegiance. It was an attempt, out of curiosity, to place myself in the shoes of an undecided voter ahead of September’s referendum, part of which is to question the merits of voting either way. Let’s just say that the answers I got, and the tone of the response, was a bit hostile, dogmatic, and as such far from convincing. I was accused of trolling, of being clueless and ‘not getting it’ – it wasn’t explained what it was I didn’t get either, which wasn’t helpful – for my philosophical line of questioning, and for doubting the prevailing opinion that there was a perpetual, institutional, xenophobic discrimination against Scottish art, mainly literature designated as Scottish, whether it be belonging to Scotland’s culture or by someone who is Scottish. I always find such blanket categorisations to lack nuance, but I found the insinuation that this was indicative of a wider attitude, applicable to other social and artistic spheres, to be an unsophisticated position, and far more troubling. James Kelman’s Booker Prize win, and the controversy surrounding it, was sighted as evidence that this exists. My argument wasn’t that an anti-Scottish sentiment exists, but that it’s as pervasive as implied. Some of the judges derided Kelman’s work yet he still won the award. Doesn’t this itself suggest that while there is snobbishness amongst academia in literature, and or xenophobia of the merits of the use of a Scottish idiom in literature, that it isn’t representative of an institutional and or cultural prejudice on a wider scale? To me it seems like a highly selective and arrogant, in light of the successes, of which Kelman is one, to present it as such. It reminds me of a process of thinking that the No campaign is rightly derided for, conjuring lies or half truths that are presented as facts solely to reaffirm an existing belief or position. I think devolving ones self to this groupthink is an abdication of your right to critical thought, to do so in this context is worse than the No campaign’s litany of lies, as the need to do so is completely redundant for Yes voters. Better Together lie because they have to, the basis of their argument is built upon the ciphers of tradition, scepticism and the supercilious assumption that Scottish people view themselves, their culture and their country within such a limited concept. The reasons to vote Yes are clearly there, creating persecutions of Scottish culture to supplement the reasons to vote Yes, especially if you feel compelled to convince others to do so based upon it, smacks of a self serving crusade built upon a thoroughly ingrained inferiority complex. That same inferiority complex that’s so brazenly and shamelessly used by Better Together in an attempt to keep people immured, to prevent them from thinking for themselves. I refer again to the quote above of independence meaning we no longer have to treat our art and culture as inferior. It begs the question of why we would in the first place, when we know many others don’t, and if we do why would supporting and then achieving independence alone change such an attitude? How we view ourselves can be indicative of how we expect others to. We should not view ourselves as victims. We are a country that throughout modern history has produced many works and ideas that have offered many advances to science, art, literature and modernity. The only legacy of us viewing ourselves and our output as inferior is that it becomes lazily infused as part of a patriotic narrative, where achievement has thrived against adversity, to help foment a phony sense of cultural identity. Perhaps I’m overreacting. Perhaps I’m the one being selective based on just this one correspondence? There is of course the possibility that I’m understating the discrimination against Scottish literature. Sadly here we find another certainty; that we live in a world where racism, xenophobia, homophobia and misogyny exist. So clearly there will be folks who dislike Scotland, Scottish people and the produces of Scottish culture. We know this to be irrational, but what’s equally irrational is to adopt a reactionary attitude that can be just as confrontational and perplexing to those who don’t share it. I’ll also concede that Twitter isn’t the ideal medium for debating anything, let alone the sort of probing I attempted. So we should consider adapting our approach to counteract the clear faults that it carries as a medium. One of Twitter’s main flaws is that it encourages short term thinking, and responses based on that mode of thinking. All of us have thoughts, benign or otherwise, that are entirely private and passive and completely unsuited to public consumption of any guise. Previously we had means and formats for publishing such thoughts, but not necessarily for immediate consumption. Now Twitter provides a vehicle for the validation of impulsive thought. Assertions of any nature can be made, but deconstructing them thoroughly and disproving or proving their validity successfully in hundred and forty characters is a far harder task. What did Adolf Hitler say about lies? A lie can spread around the world via Twitter, before the truth has had a chance to think, let alone get it breeks on and respond. As the frustratingly, for the purposes of this column, English writer Alan Bennett rightly said about the laughable Eric Pickles, ‘He’s in the grip of ideology and ideology tends to drive out thought’. In the age of social media as Yes voters we should be aware of the pitfalls of appearing to be in the thrall of ideologies that can easily and inaccurately be made synonymous with ‘Scottish Nationalism’ and all the negative connotations that are unfairly attached to it. It’s the one advantage the No campaigners have, throwing any remotely questionable and or emphatic pro Scottish prose under that umbrella term and leaving folk wasting their time justifying it as the benign commentary it so often is. So Yes supporters, myself included, should take a minute to think about how we come across on social media, how our opinions are construed, written and are likely to be disseminated by those who don’t see things as we do, and whether certain beliefs we have about Scottish identity, and what it is and should be, are constructive or even relevant to the debate about us gaining independence. This entry was posted in Politics and tagged Better Together, Scottish Art, Scottish Independence, Scottish Nationalism, Vote Yes For Scotland, Yes. Bookmark the permalink. 1 Response to Why the Scottish inferiority complex should not play any part in debating the merits of voting Yes.